We provide personal attention to every order that comes through our doors. With careful registration and attention to detail, we align each screen to make sure you receive the best possible print. If it’s a specific color ink you are looking for, we are capable of matching most PMS colors available. Give us your idea, sketch, or finished art and let us take it from there. 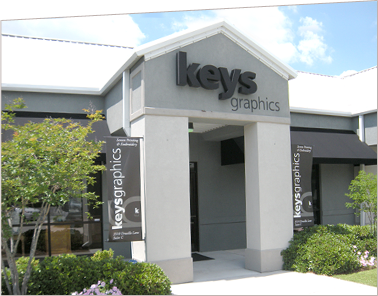 Keys Graphics is able to accommodate customers of all sizes. If you are a small business and need 24 pieces or a large event needing 24,000 pieces, we have the experience, equipment and capability to get the job done on time and for a very competitive price. Unlike the larger clearing houses you will find online and some of the larger print houses we pay personal attention to each order running through our presses at all times. We work closely with each customer to ensure the order is completed when needed and done correctly. We take the time to understand our customers’ needs and wants and treat them professionally through the entire print process. 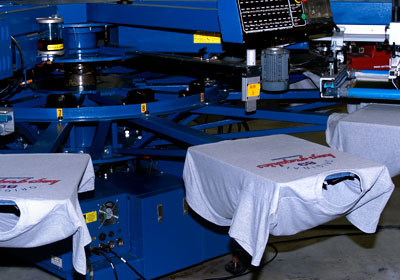 With many of our customers being return customers, they come back for the same reason each time: Excellent quality screen printing and personal customer service done right. Let us help you through each step of the design process. 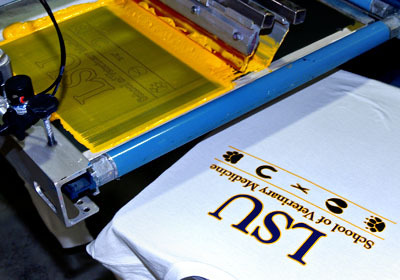 Ask for a screen printing quote today and our professionals will take care of the details. 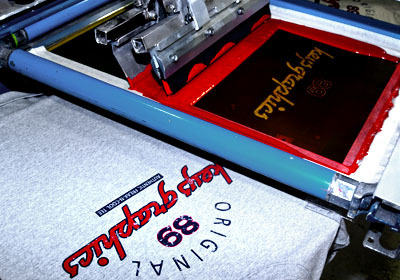 The best way to learn about screen printing is to let us guide you through the process. It involves taking your image or idea and converting it into a digital file. 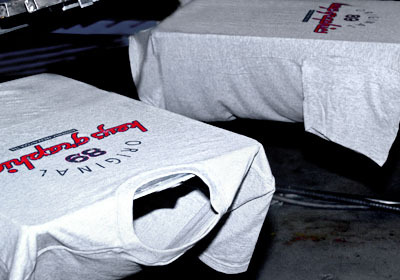 We then produce color separations specific to your order. Individual screens are then produced from the color separations. The screens are then precisely aligned on our press for a nice clean final print. 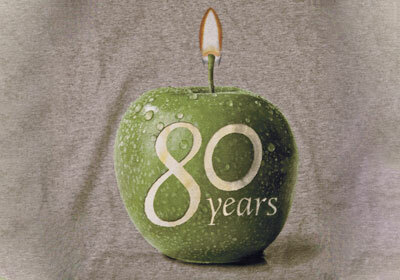 We are capable of printing up to 8 colors and can produce as many as 8000 prints per day. 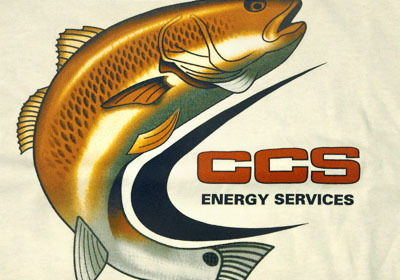 Spot color printing along with simulated process and 4 color process is also available depending on what your design requires. 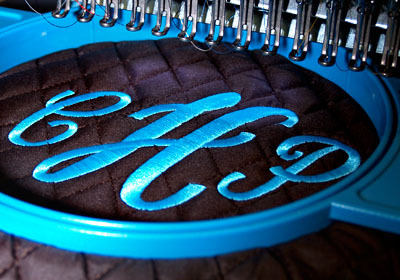 Embroidery is an art that uses thread colors and sew angles to create your design. Dimension is created by the combination of angles and colors allowing light to reflect in different ways on the stitches. 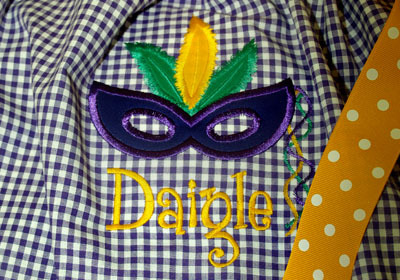 Our custom design services include applique, monograms and business logos. Many of our customers request this professional service for bridal occasions, baby gifts, professional attire and many other needs. 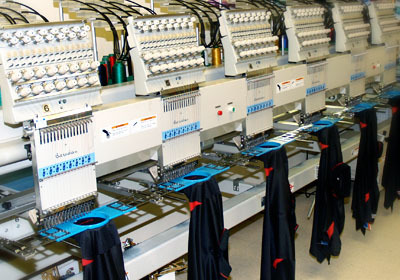 We have 24 embroidery machine heads with capability to sew 15 different thread colors. 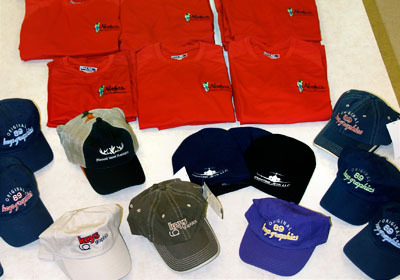 Our sew techs have over 45 years of experience in the field of embroidery. Our expert staff and superior attention to detail can make your idea come to life. 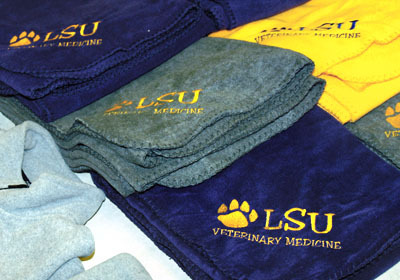 We can apply complex or simple designs to just about any flexible fabric substrate. 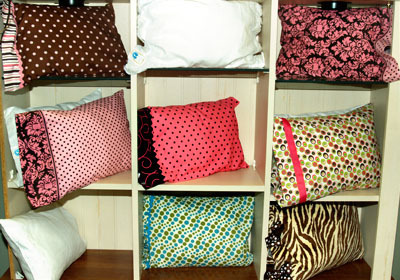 We can sew fabrics such as cotton, polyester, linen, wool, silk, vinyl and many other fabrics. We have even embroidered toilet paper – send us your design and let us show you the best way to create your idea in stitches. To embroider your items, we create a digital file from the artwork you supply by assigning every single stitch required to replicate your design. 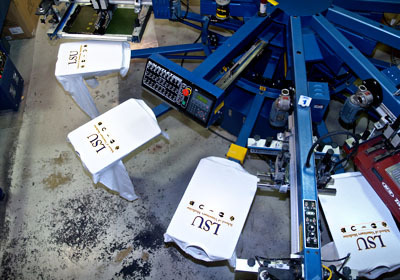 Once that is done, we upload your design to our embroidery system. Your item is then hooped in our frames and placed onto our machines. Now your design is ready to be sewn. 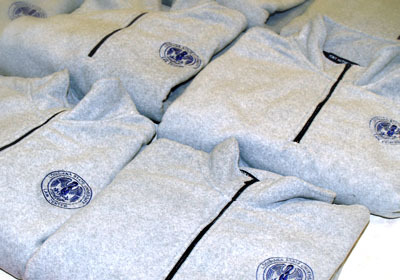 Let us give you a quote today for any of your embroidery needs. 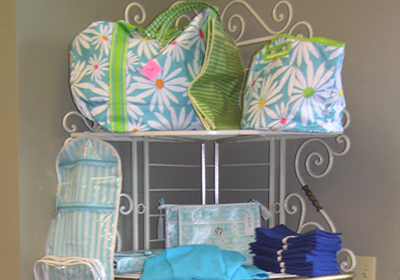 We invite you to visit our showroom of great gift ideas - bags, robes, baskets, towels, baby items and more. 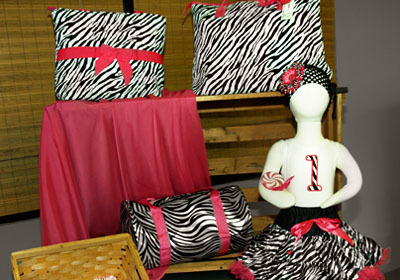 Our experienced customer service professionals will help you pick out the perfect gift, then choose from hundreds of designs and alphabet fonts to best decorate your item. 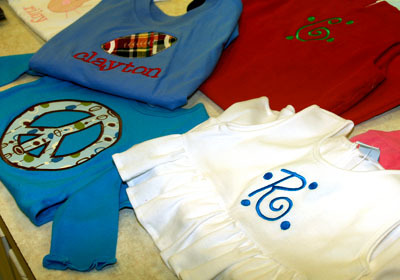 Embroidered names, 3 letter monograms, cute kid's designs or elaborate appliqué designs will make your gift a one of a kind. 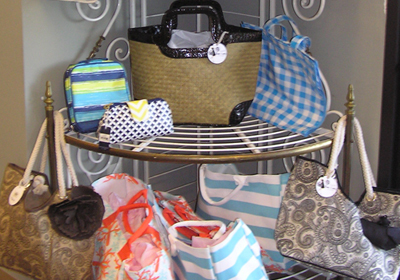 You are also welcome to bring in your own items that you want decorated. So come in and let us help bring your ideas to life. 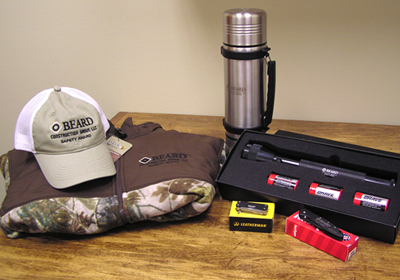 Here are some of the goods we carry here on the Keys Graphics showroom floor. 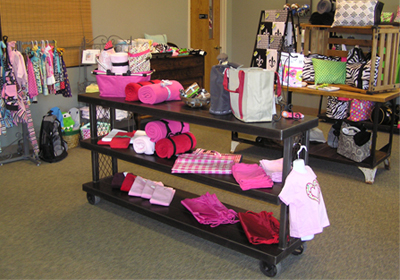 Come and see what we can customize for you today! 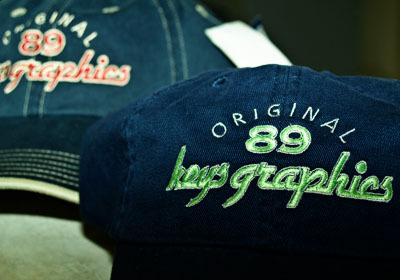 Keys Graphics was founded by Remie Keys Morel. 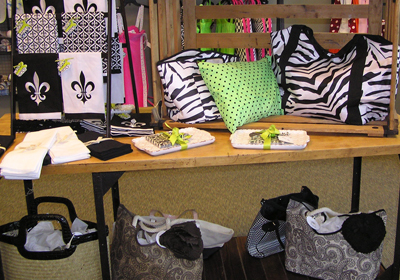 Originally named Keys Cottons, Remie began his business in 1989 while attending college at LSU. His first t-shirt job was hand-painting shirts for his sister’s sorority. This introduced him to the world of screen printing for different university groups. Creating the artwork, he began contracting out his printing to a local printer while still in school. Throughout his college career he served the groups of LSU and businesses in the local area with personal service and quality. While in the College of Design at LSU Remie met his future wife, Michelle, working right next to him in class. After graduating with a degree in Graphics Design, Remie and Michelle married and he began managing the shop that was printing his work. Taking the next step, they bought that same shop he managed in 1995 with the intention of growing a business that provides personal service and quality second to none. 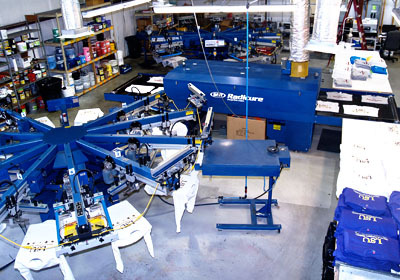 Since 1995, the business has grown from a small screen printing and embroidery company occupying 1200 square feet with 3 employees to its present 8,000 square foot building with 18 employees located on Drusilla Lane. 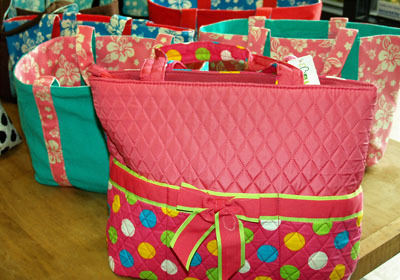 Remie & Michelle place a high standard on themselves and their employees to create the very best products around. They are very proud to have served the Baton Rouge area for all these years and look forward to continue to do so for many, many more. We are happy to serve you. For assistance or questions, or if you would like a quote on any project, please give us a call and we will be happy to help you out. You can reach us either by phone, fax or email. © 2019 Keys Graphics. All Rights Reserved.